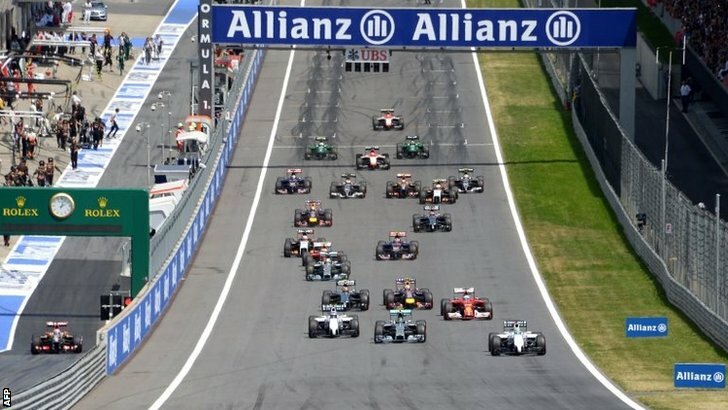 Formula One: Silver Arrows superior in Speilberg as Rosberg wins again! 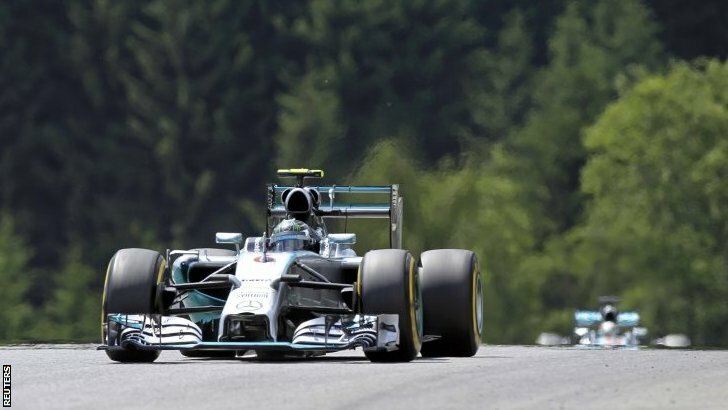 Home » Formula One: Silver Arrows superior in Speilberg as Rosberg wins again! Nico Rosberg has won the 2014 Austrian Grand Prix after a 4 way fight for the lead between the Mercedes and Williams cars! Lewis Hamilton fought his way through from 9th to take 2nd place, with the Briton putting the pressure on his team-mate in the last half of the race. Finnish driver Valtteri Bottas grabbed his first podium of his career and the first podium for Williams this season. Both Williams cars got away cleanly from the line at the start of the race, but Nico Rosberg got the upper hand on Bottas to sneak past into turn 1. The Williams cars seemed to have the higher top speed, which Valtteri used to his advantage by getting back past at turn 2. One Mercedes was unable to progress, but the other was doing enough for the both of them! Lewis had made 2 mistakes in the final qualifying session yesterday and was therefore starting the race in 9th. He managed to squeeze in between Kvyat and Raikkonen to move up two positions into 7th. He then got past Ricciardo who was forced onto the run-off area and then past Magnussen to be up behind Alonso. A swift out-breaking manoeuvre into turn 2 put Hamilton past his former team-mate and on to the back of his current one! 5 positions in 2 corners after a fantastic start by Lewis Hamilton! Whilst Lewis was gaining positions, Sebastian Vettel was losing them. At the start of the second lap Sebastian started slowing and reported that he’d lost drive again. He put his car to a dead stop just before turn 3 and looked as if he was about to get out of the car. Suddenly he managed to get power back on his RB10 and merged back in to the middle of the pack a lap down in last place. With the highest temperatures of the whole weekend bathing the track, the pit-stops came around very quickly due to the increased tyre degradation. Jean-Eric Vergne and Nico Hulkenberg pitted and changed to the soft compound first, with Daniil Kvyat, Kevin Magnussen and Daniel Ricciardo all following soon after. The 4 leading cars pitted one at a time on laps 12 to 15, with Rosberg pitting from third followed by Hamilton, Massa and Bottas. Once the pit-stops has shaken out, Rosberg was in 2nd followed by Bottas and Hamilton, with Massa falling to the back of the leading train. In front of all the leaders was Sergio Perez, who once again was proving that Force India were very kind on their tyres. It looked as though Sergio was going to hold up the leaders as he had done so in Canada, but he managed to maintain a gap of half a second over Rosberg for a number of laps. It took until lap 27 for Nico to charge up the inside of Sergio at turn 2. Perez was slow on the exit of the corner which allowed Bottas to out-drag him to turn 3. It took until the next lap for Hamilton to follow Nico and Valtteri though, with the Briton doing so at turn 2. With Perez obviously losing grip he pitted at the end of lap 29 and came out in 8th place. He later went on to move up to 7th when Force India elected to let him pass his team-mate Nico Hulkenburg due to differentiating strategies. Sebastian Vettel’s day went from bad to worse as he pitted at the same time as Perez for a new front wing. The German was on the back of Esteban Gutierrez coming out of turn 3 when he just caught the Sauber’s rear left with the right end plate of his wing. Sebastian re-emerged onto the circuit with a new wing for a few more laps before his team opted to retire the car to save mileage on his engine; with reliability being key in this year’s championship. The second and final pit-stop phase begun on lap 40, with Lewis Hamilton being told “It’s hammer time,” over the radio. He came into the pits the next time by, with Rosberg following on the lap after. Lewis was unable to jump Nico in the pit-stop, with Nico’s stop being a second quicker, but he was able to jump Bottas after setting the fastest lap of the race on his out-lap. Massa was briefly back in the lead but pitted soon after, he emerged in 6th place behind Perez, who was due to pit later on in the race. Alonso was into the lead of the race for the first time since Italy last year. He stayed out for a few laps before pitting on lap 47 and emerging behind Perez and Massa. Perez pitted late on lap 56 of 71 and emerged just ahead of his team-mate this time who was in 8th place. 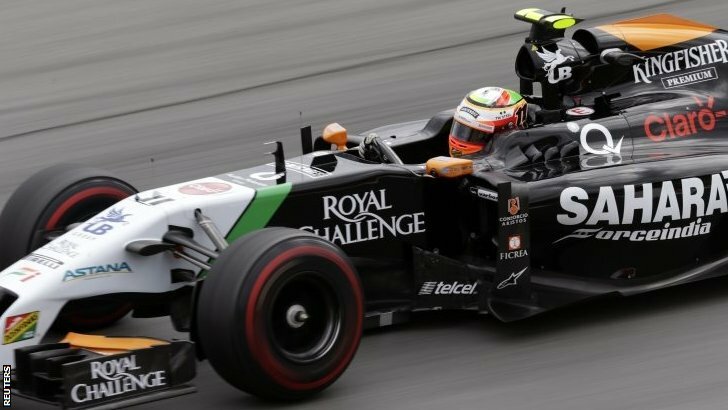 The Mexican quickly became the fastest man on the circuit after finally fitting the super-soft compound to his Force India. He started diminishing the lead to Magnussen in 6th place before pulling off an easy move on the run to turn 2. Back up the front, Hamilton was trying to close the lead to Rosberg for P1. The last 20 laps had seen the pair’s advantage over one another ebb and flow between them. Hamilton would make up a few tenths before Rosberg would pull out a little. The gap decreased down to just over a second in the final two laps, with Hamilton finally gaining DRS use as the pair started the final lap. Rosberg began to feel the pressure as they rounded turn 3, with Rosberg running wide. Hamilton made the same mistake meaning that his only chance to pass Nico was gone. There was nothing more Lewis could do but follow Nico to the finish line. Nico crossed the line to take his 3rd win of the season and to extend his lead in the championship to 29 points. Lewis Hamilton had to settle for 2nd, but after starting 9th he can say without a doubt that he did all he could to limit any possible damage after a poor qualifying result. Valtteri Bottas held on to take his first podium of his Formula One career, an opportunity he could have had earlier this year had it not been for a spate of bad luck upon the Williams team. Team-mate Felipe Massa scored a solid 12 points in 4th place, but will no doubt be regretting the escape of a podium after starting from pole position. Fernando Alonso chased down Felipe Massa as best he could in the closing stages of the race, but growing tyre degradation halted his charge before it had really begun. The late pass on Kevin Magnussen by Sergio Perez put the Force India driver into 6th at the end of the race, with the Dane in the McLaren holding on to get 7th. Daniel Ricciardo managed to complete a late charge in the final stint to get up into the points positions, with a move around the outside of Hulkenburg at turn 4 on the last lap putting the Canadian winner into 8th place. Hulkenburg had to settle for 9th, with Kimi Raikkonen completing the points in 10th place. Jenson Button was just outside of the points in 11th, with Pastor Maldonado having a solid race in 12th for Lotus. Adrian Sutil separated the two Lotus cars in 13th, with Grosjean behind him after starting from the pit-lane. Jules Bianchi and Kamui Kobayashi had a late battle over 15th place, with Bianchi coming out on top after a pass at turn 1. Max Chilton finished 17th ahead of Marcus Ericsson, with Gutierrez being the last classified finisher after a torrid afternoon. The Sauber team released Esteban with a wheel loose early in the race, costing them a lot of time while they fixed the issue. They were then given a 10 second stop-and-go penalty for the unsafe release, as well as a 10 place grid penalty for the British Grand Prix. Ironically, all three retirements from the Austrian Grand Prix at the Red Bull Ring were sponsored by Red Bull. Jean-Eric Vergne was the first retirement after suffering a brake failure in his Toro Rosso. Sebastian Vettel, as mentioned previously, retired in a bid to save his engine for future races this season. Daniil Kvyat was the last unfortunate retirement after a rear tyre failure left him unable to turn. He ventured through the gravel trap at turn 4 before finding an escape road to park his car. Lewis Hamilton who finished second: “I have to look at the feedback, maybe my positioning isn’t right. The guys have done a fantastic job for us to get another one-two and the fans here have been insane. Formula One: Lewis Hamilton claims third world championship in crazy US Grand Prix.